Tory Historian is, as all readers of this blog know, a great fan of detective stories, particularly those of the Golden Age (and before) but not so enamoured of modern writers continuing sagas, being fully in agreement with this waspish analysis. Two minor additions are required: Jill Paton Walsh's subsequent Lord Peter Wimsey novel, The Attenbury Emeralds, was extremely poor and the character of Hercule Poirot is being revived by Sophie Hannah in the forthcoming hefty tome, The Monogram Murders. As we await with some trepidation that promised "new Agatha Christie", as it is advertised but mysteriously being written by Sophie Hannah, there is some good news on the continuation front. 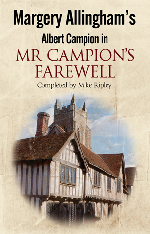 Mike Ripley, himself a much lauded writer of detective stories, has completed the last Mr Campion adventure, and entitled it Mr Campion's Farewell, presumably fitting in with the previous two, Mr Campion's Farthing and Mr Campion's Falcon. The completion of a fragment should, presumably, be in a different category from the continuation of a series, which consists of the appropriation of someone else's creation. (Dorothy L. Sayers who mused a great deal on creativity in The Mind of the Maker, would have particularly disliked it, in Tory Historian's opinion.) The story of Mr Campion's existence is a little complicated. He was definitely Margery Allingham's creation but there is evidence that her husband Philip "Pip" Youngman Carter participated in some way in the production of the novels. Mike Ripley refers to it as "collaborated" and that is a loaded term. After Allingham's death in 1966 her husband completed the novel she had started, Cargo of Eagles (published in 1968) then wrote rather rapidly two more, the one about the Farthing (published in 1969) and the one about the Falcon (published in 1970). He completed a couple of chapters of a third one before he, too, died in 1969. So there we were, with a fragment, no plot outline or character analysis, published by the Margery Allingham Society in The Bottle Street Gazette in 2008 - 9 when Mike Ripley, a great fan of the Allingham books, an expert on Albert Campion and a man who lived for twenty years within ten miles of Tolleshunt d'Arcy in Essex, the home of Allingham and Youngman Carter offered to finish the novel and suggested the title (the society having called the fragment Mr Campion's Swansong) and his offer was accepted by Barry Pike, the Society's Chairman, the manuscript having been left to them by Allingham's sister, Joyce, in 2001. All this background is necessary to explain why the story of this particular novel is slightly different from the usual continuation of detective series, though Tory Historian finds it a little hard to accept that having completed the manuscript Mr Ripley has found it necessary to write another novel in the series. The last page of Mr Campion's Farewell tells us that "Mr Campion will return in Mr Campion's Fox". Hmmm. Mr Ripley makes it quite clear that his style is modelled on Philip Youngman Carter's and not on Margery Allingham's, which is a great advantage from TH's point of view, Allingham's verbose and opaque style not being a favourite. Having not yet read either Farthing or Falcon, TH cannot judge whether the modelling or imitation is successful but it is definitely crisper and more amusing than a good deal of Ms Allingham's own writing, a statement that is likely to produce anathema on this blog from a number of readers. The one complaint TH has to make is that Campion's supposed royal connection (invented as a one-upmanship against Dorothy L. Sayers, who had a duke's younger brother as a hero, even if it was the richest ducal family) merely hinted at by Allingham, becomes far too prominent in this novel. Not many of the usual characters appear even though the action takes place in the Suffolk wool town of Lindsay Carfax, based, according to Mr Ripley who knows, on Lavenham and in Cambridge. Lady Amanda Campion née Fitton (as she is apparently still known professionally) makes her presence felt very strongly. She has become a well-known aeroplane designer and air industry consultant though the firm she and Campion's brother-in-law, Alan Dell, had set up in the thirties has, we assume, been swallowed up by the state-owned air industry, just as the Ruritanian kingdom her brother had taken over in Sweet Danger must have long ago become part of some People's Republic. None of this is mentioned in this novel. There is, however, a sly reference to Lady Amanda attending a board meeting of some investment bank where she is "struggling to present the benefits of a delayed and over-budget British jet engine over a much cheaper American one which they could buy off the shelf". 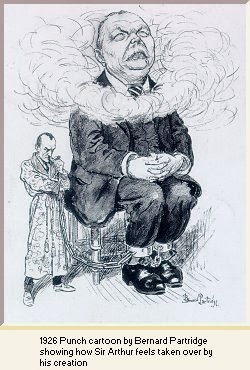 Lugg, the "vulgarian in Mr Campion's service" makes a fleeting appearance if that adjective can be used in connection with him and Charlie Luke, still only Chief Inspector, sends Campion off on his adventure by telling a tale of obvious and rather mysterious wrongdoings in Lindsay Carfax, casually mentioning that Campion's or, rather, Amanda's niece (presumably the "little king's" daughter), Eliza Jane Fitton, an artist, lives there and is very close to a young man who is known to be a "Carder", one of a mysterious group of people who run the town, no doubt, for its own good. The Campions' son, Rupert, is now an actor and married to an actress who is a bit of a luvvie, and they both do a bit of sleuthing for the old man on the Riviera but TH cannot help regretting that Rupert did not marry Charlie Luke's daughter, last sighted by TH as a formidable toddler about to wreak havoc on a number of lives. Whatever happened to her? Campion, who is about 69 in the novel and makes numerous comments about his age, becomes involved in the various nefarious goings on, trying to solve several mysteries at once. As is the wont of such novels those separate mysteries coalesce though only more or less. One strand is worked out quite cogently though not at all surprisingly and the clue about who might be a member of the Carders is very clever (though the people are rather obvious). There are references to suspicious deaths in the past. Charlie Luke talks of one that had taken place about thirty years previously, adding that had he been in charge, it would have been a murder investigation. The reader is not overwhelmingly surprised to find out towards the end of the book that it had, indeed, been a murder though the motive is quite ridiculously slight. The other suspicious death or, rather, deaths is of two Cambridge archaeology students the previous year. It is all tangled up with an invasion by hippies (the summer of 1968) and the Carders imposing certain discipline or apparently so. In fact, we never really find out whether the two students were murdered deliberately or were accidentally given a much too strong dose of LSD by someone who did not know how to dilute the drug but wanted to teach them a lesson. Are these important problems or merely niggling complaints? It really depends on how seriously one takes detective literature. Tory Historian takes it very seriously and considers these complaints to be important while admitting that they did not spoil the enjoyment of the book for more than a couple of minutes at a time. A significant aspect of the election was the difference in the voting patterns between England and the Celtic fringe: Gladstone lost heavily in England, but his supporters won a majority of seats in Scotland, Wales and Ireland. Nevertheless, the English predominance gave victory to Salisbury and enabled him to set about the composition of his second ministry. In fact the predominance, as can be seen from the figures above, was very handsome. Yet, it is interesting to see how early that pattern set in. These days it is the Labour Party that tends to win in the Celtic fringe with Northern Ireland presenting a picture that is as different from the rest of the country as Ireland was then. Some of us still remember when the Scottish Conservative Party was a power in the land and when a number of Scottish seats were more or less permanently reserved for the Liberal Party as it was then. All that has changed but the different pattern between England and the rest of the United Kingdom remains. Tory Historian salutes the great Duke of Wellington, whose birthday it is today. As he was born in 1769, this is not a particularly notable anniversary (345 years) but worth remembering. Curzon was never a political intellectual. He cared for the display and workings of politics, for oratory, statesmanship, the practice of government. He was not much interested in Tory philosophers. Hume and Burke interested him far less than Pitt or Canning. Principles were more important the ideas and efficient administration more important than either. TH cannot help wondering how many politicians actually understand the difference between those concepts.